In the cover, Straw Hats are drawing an eyebrow on Ryo-san's bounty poster. Ryo-san is a protagonist of Kochikame. 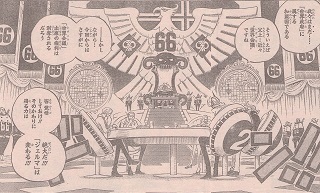 Judge says that World Government will deprive them of the right to attend Reverie sijnce Germa becomes Big Mom's subordinate. But he is glad that Germa will obtain a greater power. Niji provokes Sanji. Ichiji and Niji (and Reiju?) were sometimes talking about how it would be funny if Sanji had died a dog's death. Sanji tells Niji not to leave his plate of food unfinished, but Niji says that the food is sticky and horrendous. Sanji calls him "foolish prince." Niji throws the plate to the head chef Cosette, but Sanji stops it. Sanji "Are you going to injure a woman's face!!?" He eats the food fallen from the plate. He praises the food made by Cosette, which makes her shed tears with joy. Niji gets enraged and intends to kick Sanji in the face, but Judge stops him for the wedding. Cosette is blown away by the wind pressure of Niji's kick. Ichiji says that Sanji is disgrace for Vinsmoke. Sanji is pissed off and yells that those who can't respect food and beat women and Royals that don't care about their subordinate are all against his aesthetics. Judge brings the pic of Zeff. He knows Baratie. He says if Sanji doesn't obey him, Zeff will be killed. Sanji is shocked and recalls the days he spent in Baratie. After breakfast, Sanji found Cosette lying in blood in the castle. Yonji appears and takes Sanji to Niji. In the segregated facilities in depths of the castle, Sanji finds Germa soldiers in capsules filled with liquid. "I can't help crying. Akimoto-sensei is now free!! He is FREE!!!"